Trafalgar Square is a world famous square in central London. 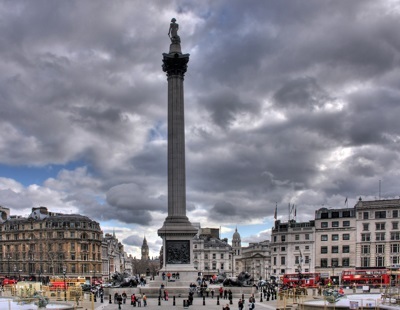 At the center of the square stands Nelson's Column. This is a monument to the British naval victory over the French and Spanish fleets at the Battle of Trafalgar in 1805. The column is made from granite, is 151 feet (46 meters) high, and topped by an 18 foot (5½ meter) statue of Admiral Horatio Nelson. At the bottom of the column is a square pedestal which is decorated with bronze panels (these having been cast from captured French cannon), as well four large lion statues which guard the column. At the four corners of the square, and four plinths. Three of these hold statues, namely of King George IV (Northeast plinth), Henry Havelock (Southeast plinth), and Sir Charles Napier (Southwest plinth). The Northwest plinth does not however have a permanent statue, and thus has been used for various temporary statues and art installations. Various proposals have been made for possible permanent statues for the Northwest plinth, and for even changing the other existing statues, but so far none has been enacted. On the North side of the square is the National Gallery. In the past, Trafalgar Square was home to many pigeons, and a popular tourist activity was feeding them. Today, however bird seed is no longer sold at the square, feeding birds and pigeons has been banned, and most pigeons have been diven away from the area. Trafalgar has often been used political demonstrations. In recent years, it has also sometimes been used for victory celebrations when British or English teams win sporting events, and giant video screen have on occasion been erected in the square for important England soccer matches. Every year since 1947, a large Christmas tree from Norway has been displayed in the square. This tradition commemorates British support for Norway during World War II.